The state-funded education system is divided into stages based upon age: Early Years Foundation Stage (ages 3–5); primary education (ages 5 to 11), subdivided into Key Stage 1 (KS1) Infants (ages 5 to 7) and Key Stage 2 (KS2) Juniors (ages 7 to 11); secondary education (ages 11 to 16), subdivided into Key Stage 3 (KS3; ages 11 to 14) and Key Stage 4 (KS4; ages 14 to 16); Key Stage 5 is post-16 education (ages 16 to 18); and tertiary education (for ages 18+). At age 16 the students typically take exams for the General Certificate of Secondary Education (GCSE) or other Level 1/2 qualifications. While education is compulsory until 18, schooling is compulsory to 16, thus post-16 education can take a number of forms, and may be academic or vocational. This can involve continued schooling, known as "sixth form" or "college", leading (typically after two years of further study) to A-level qualifications (similar to a high school diploma in some other countries), or a number of alternative Level 3 qualifications such as Business and Technology Education Council (BTEC), the International Baccalaureate (IB), Cambridge Pre-U, WJEC or Eduqas. It can also include work-based apprenticeships or traineeships, or volunteering. Higher education often begins with a three-year bachelor's degree. Postgraduate degrees include master's degrees, either taught or by research, and doctoral level research degrees that usually take at least three years. Tuition fees for first degrees in public universities are up to £9,250 per academic year for English, Welsh and European Union students. The Regulated Qualifications Framework (RQF) covers national school examinations and vocational education qualifications. It is referenced to the European Qualifications Framework, and thus to other qualifications frameworks across the European Union. The Framework for Higher Education Qualifications (FHEQ), which is tied to the RQF, covers degrees and other qualifications from degree-awarding bodies. This is referenced to the Qualifications Framework of the European Higher Education Area developed under the Bologna process. Until 1870 all schools were charitable or private institutions, but in that year the Elementary Education Act 1870 permitted local governments to complement the existing elementary schools in order to fill any gaps. The Education Act 1902 allowed local authorities to create secondary schools. The Education Act 1918 abolished fees for elementary schools. Women's colleges were established in the 19th century to give women access to university education, the first being Bedford College, London (1849), Girton College, Cambridge (1869) and Newnham College, Cambridge (1871). The University of London established special examinations for women in 1868 and opened its degrees to women in 1878. University College Bristol (now the University of Bristol) became the first mixed higher education institution on its foundation in 1876, followed in 1878 by University College London (which had held some mixed classes from 1871). Full-time education is compulsory for all children aged 5 to 18, either at school or otherwise, with a child beginning primary education during the school year they turn 5. Children between the ages of 3 and 5 are entitled to 600 hours per year of optional, state-funded, pre-school education. This can be provided in "playgroups", nurseries, community childcare centres or nursery classes in schools. The age at which a student may choose to stop education is commonly known as the "leaving age" for compulsory education. This age was raised to 18 by the Education and Skills Act 2008; the change took effect in 2013 for 16-year-olds and 2015 for 17-year-olds. From this time, the school leaving age (which remains 16) and the education leaving age (which is now 18) have been separated. State-provided schooling and sixth-form education are paid for by taxes. All children in England must currently therefore receive an effective education (at school or otherwise) from the first "prescribed day", which falls on or after their fifth birthday until their 18th birthday, and must remain in school until the last Friday in June of the school year in which they turn 16. The education leaving age was raised in 2013 to the year in which they turn 17 and in 2015 to their 18th birthday for those born on or after 1 September 1997. The prescribed days are 31 August 31 December and 31 March. The school year begins on 1 September (or 1 August if a term starts in August). The Compulsory stages of education are broken into a Foundation Stage (actually covering the last part of optional and first part of compulsory education), 4 Key Stages, and post-16 education (sometimes unofficially termed Key Stage Five, which takes a variety of forms including 6th Form (covering the last 2 years of Secondary Education in schools). Below is a table summarising the most common names of the various schools and stages. Grammar schools are normally state-funded but selective schools, admitting children from 11 years old onward, but there are exceptions. The government has been unable to recruit sufficient teachers and lecturers. There are 1,000 too few computing teachers, 1,200 too few physics teachers and 1,850 too few maths teachers. Lecturers in further education colleges fell by just under 20,000 from 2010 to 2017. The public sector pay cap is blamed. English secondary schools have 15,000 fewer teachers and teaching assistants than they had two years ago. This leads to larger classes as well as pupils getting less individual attention. Many teachers leave within four years of starting work as teachers. The problem is most acute in inner London with only 57% of teachers who qualified in 2012 still working as teachers in 2017. The Department for Education predicts secondary school pupil numbers will rise by 19.4% from 2017 to 2025. Thousands of children with special education needs (SEND) are at home without a school place because funding for places was not provided. The number rose from 1710 in 2016 to 4050 in 2017. SEND funding, provides for children with conditions like autism, attention deficit hyperactivity disorder and physical disabilities. Some local authorities are raiding other budgets to provide for SEND children or getting into debt to fund SEND. Others are cutting help for SEND pupils. There is legal action against many local authorities over failure or possible failure to meet the needs of SEND children. There is also legal action planned against the central government for not funding the system. Some 93% of children between the ages of 3 and 18 are in education in state-funded schools without charge (other than for activities such as swimming, theatre visits and field trips for which a voluntary payment can be requested, and limited charges at state-funded boarding schools). Allerton High School, a typical former secondary modern school in Leeds, West Yorkshire. Academy schools, established by the 1997-2010 Labour Government to replace poorly-performing community schools in areas of high social and economic deprivation. Their start-up costs are typically funded by private means, such as entrepreneurs or NGOs, with running costs met by Central Government and, like Foundation schools, are administratively free from direct local authority control. The 2010 Conservative-Liberal Democrat coalition government expanded the role of Academies in the Academy Programme, in which a wide number of schools in non-deprived areas were also encouraged to become Academies, thereby essentially replacing the role of Foundation schools established by the previous Labour government. They are monitored directly by the Department for Education. In 2018 it was reported that several academies were struggling financially and running deficits. Community schools (formerly called county schools), in which the local authority employs the schools' staff, owns the schools' lands and buildings, and has primary responsibility for admissions. Free schools, introduced by the Conservative-Liberal Democrat coalition following the 2010 general election, are newly established schools in England set up by parents, teachers, charities or businesses, where there is a perceived local need for more schools. They are funded by taxpayers, are academically non-selective and free to attend, and like Foundation schools and Academies, are not controlled by a local authority. They are ultimately accountable to the Secretary of State for Education. Free schools are an extension of the existing Academy Programme. The first 24 free schools opened in Autumn 2011. Voluntary Aided schools, linked to a variety of organisations. They can be faith schools (about two thirds Church of England-affiliated; just under one third Roman Catholic Church, and a few another faith), or non-denominational schools, such as those linked to London Livery Companies. The charitable foundation contributes towards the capital costs of the school (typically 10%), and appoints a majority of the school governors. The governing body employs the staff and has primary responsibility for admissions. Voluntary Controlled schools, which are almost always faith schools, with the lands and buildings often owned by a charitable foundation. However, the local authority employs the schools' staff and has primary responsibility for admissions. In addition, three of the fifteen City Technology Colleges established in the 1980s still remain; the rest having converted to academies. These are state-funded all-ability secondary schools which charge no fees but which are independent of local authority control. There are also a small number of state-funded boarding schools. English state-funded primary schools are almost all local schools with a small catchment area. More than half are owned by the Local Authority, though many are (nominally) voluntary controlled and some are voluntary aided. Some schools just include infants (aged 4 to 7) and some just juniors (aged 7 to 11). Some are linked, with automatic progression from the infant school to the junior school, and some are not. A few areas still have first schools for ages around 4 to 8 and middle schools for ages 8 or 9 to 12 or 13. English secondary schools are mostly comprehensive (i.e. no entry exam), although the intake of comprehensive schools can vary widely, especially in urban areas with several local schools. Nearly 90% of state-funded secondary schools are specialist schools, receiving extra funding to develop one or more subjects in which the school specialises, which can select up to 10% of their intake for aptitude in the specialism (though relatively few of them have taken up this option). In a few areas children can enter a grammar school if they pass the eleven plus exam; there are also a number of isolated fully selective grammar schools and a few dozen partially selective schools. A significant minority of state-funded schools are faith schools, which are attached to religious groups, most often the Church of England or the Roman Catholic Church. Approximately 7% of school children in England attend privately run, fee-charging independent schools. Some independent schools for 13–18-year-olds are known for historical reasons as 'public schools' and for 8–13-year-olds as 'prep schools'. Some schools offer scholarships for those with particular skills or aptitudes, or bursaries to allow students from less financially well-off families to attend. Independent schools do not have to follow the National Curriculum, and their teachers are not required or regulated by law to have official teaching qualifications." The 1944 Education Act (Section 36) stated that parents are responsible for the education of their children, "by regular attendance at school or otherwise", which allows children to be educated at home. The legislation places no requirement for parents who choose not to send their children to school to follow the National Curriculum, or to give formal lessons, or to follow school hours and terms, and parents do not need to be qualified teachers. Small but increasing numbers of parents do choose to educate their children outside the conventional school systems. Officially referred to as "Elective Home Education", teaching ranges from structured homeschooling (using a school-style curriculum) to less-structured unschooling. Education Otherwise has supported parents who wished to educate their children outside school since the 1970s. The state provides no financial support to parents who choose to educate their children outside of school. Students at both state schools and independent schools typically take GCSE examinations, which mark the end of compulsory education in school. Above school-leaving age, the independent and state sectors are similarly structured. In the 16–18 age group, sixth form education is not compulsory, but mandatory education or training until the age of 18 was phased in under the Education and Skills Act 2008, with 16-year-olds in 2013 and for 17-year-olds in September 2015. While students may still leave school on the last Friday in June, they must remain in education of some form until their 18th birthday. The Institute for Fiscal Studies reported funding for sixth form and further education students has been reduced, “much more sharply” than for other types of education, and spending for each sixth form student has been reduced by 21% since 2010. Further Education has experienced an 8% real terms cut since 2010/11 causing course closures, job losses and reductions in student support services. Students over 16 typically study in the sixth form of a school, in a separate sixth form college, or in a Further Education (FE) College. Courses at FE colleges, referred to as further education courses, can also be studied by adults over 18. Students typically study Level 3 qualifications such as A-levels, BTEC National awards and level 3 NVQs. Some 16–18 students will be encouraged to study Key Skills in Communication, Application of Number, and Information Technology at this time. The National Apprenticeship Service helps people 16 or more years of age enter apprenticeships in order to learn a skilled trade. Traineeships are also overseen by the National Apprenticeship Service, and are education and a training programmes that are combined with work experience to give trainees the skills needed to get an apprenticeship. Apprenticeships come in four levels: Intermediate (level 2), Advanced (level 3), Higher (level 4 – 7) and Degree (level 6 – 7). Intermediate apprenticeships are equivalent to 5 GCSEs at A* – C, Advanced to 2 A-levels, Higher to a foundation degree or above, and Degree apprenticeships to a bachelor's or master's degree. A study in 2014 found that unemployment rates among former apprentices one year after completing their apprenticeships were one-third those of university graduates one year after finishing their degrees. A 2015 study by the Sutton Trust found that, while average net lifetime earnings for those who had completed level 5 apprenticeships were higher than those for graduates from non-Russell Group universities, most apprenticeships offered were at levels 2 and 3, providing little improvement over earnings from secondary school qualifications. The report also found that apprenticeships had a lower perceived value compared to degrees in Britain than in many other countries. A view from one of the postgraduate study carrels at the Clock Tower of Maughan Library, King's College London, one of the founding colleges of University of London. 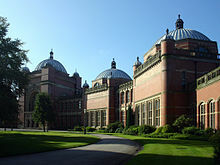 The University of Birmingham, a 'Red Brick university'. Higher education in England is provided by Higher Education (HE) colleges, university colleges, universities and private colleges. Students normally enter higher education as undergraduates from age 18 onwards, and can study for a wide variety of vocational and academic qualifications, including certificates of higher education and higher national certificates at level 4, diplomas of higher education, higher national diplomas and foundation degrees at level 5, bachelor's degrees (normally with honours) at level 6, and integrated master's degrees and degrees in medicine, dentistry, and veterinary science at level 7. Historically, undergraduate education outside a small number of private colleges and universities has been largely state-financed since the 1960s, with a small contribution from top-up fees introduced in the 1990s, however fees of up to £9,000 per annum have been charged from October 2012. 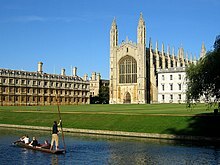 There is a perceived hierarchy among universities, with the Russell Group seen as being composed of the country's more prestigious universities. League tables of universities are produced by private companies and generally cover the whole UK. The state does not control university syllabuses, but it does influence admission procedures through the Office for Fair Access (OFFA), which approves and monitors access agreements to safeguard and promote fair access to higher education. The independent Quality Assurance Agency for Higher Education inspects universities to assure standards, advises on the granting of degree awarding powers and University title, and maintains the Quality Code for Higher Education, which includes the Framework for Higher Education Qualification. Unlike most degrees, the state has control over teacher training courses, and standards are monitored by Ofsted inspectors. The typical first degree offered at English universities is the bachelor's degree with honours, which usually lasts for three years, although more vocational foundation degrees, typically lasting two years (or full-time equivalent) are also available in some institutions. Many institutions now offer an integrated master's degree, particularly in STEM subjects, as a first degree, which typically lasts for four years, the first three years running parallel to the bachelor's course. During a first degree students are known as undergraduates. The difference in fees between integrated and traditional postgraduate master's degrees (and that fees are capped at the first degree level for the former) makes taking an integrated master's degree as a first degree a more attractive option. Integrated master's degrees are often the standard route to chartered status for STEM professionals in England. Doctorates (typically taken in three years) – research degrees at level 8, the top level of the qualifications frameworks, often requiring a master's degree for entry. These may be purely research based (PhD/DPhil) or research and practice (professional doctorates). "New Route" PhDs, introduced in 2001, take at least 4 years and incorporate teaching at master's level. Postgraduate education is not automatically financed by the state. Until the academic year 2011-2012 most undergraduates paid fees that were set at a maximum of £3,375 per annum. These fees are repayable after graduation, contingent on attaining a certain level of income, with the state paying all fees for students from the poorest backgrounds. UK students are generally entitled to student loans for maintenance. Undergraduates admitted from the academic year 2012-2013 have paid tuition fees set at a maximum of up to £9,000 per annum, with most universities charging over £6,000 per annum, and other higher education providers charging less. Postgraduate fees vary but are generally more than undergraduate fees, depending on the degree and university. There are numerous bursaries (awarded to low income applicants) to offset undergraduate fees and, for postgraduates, full scholarships are available for most subjects, and are usually awarded competitively. Different arrangements apply to English students studying in Scotland, and to Scottish and Welsh students studying in England. Students from outside the UK and the EU attending English universities are charged differing amounts, often in the region of £5,000 - £20,000 per annum for undergraduate and postgraduate degrees. The actual amount differs by institution and subject, with the lab based subjects charging a greater amount. One or two year access courses, to allow adults without suitable qualifications access to university. The Open University runs undergraduate and postgraduate distance learning programmes. The Workers' Educational Association offers large number of semi-recreational courses, with or without qualifications, made available by Local Education Authorities under the guise of Adult Education. Courses are available in a wide variety of areas, such as holiday languages, crafts and yacht navigation. The two qualifications frameworks in England are the Regulated Qualifications Framework (RQF), for qualifications regulated by Ofqual, and the Framework for Higher Education Qualifications (FHEQ) for qualifications granted by bodies with degree awarding powers, overseen by the Quality Assurance Agency. These share a common numbering scheme for their levels, which was also used for the earlier Qualifications and Credit Framework. The RQF is linked to the European Qualifications Framework (EQF) and the FHEQ to the Qualifications Framework of the European Higher Education Area (QF-EHEA). In 2012, Schools Minister Nick Gibb said that “strong evidence has been emerging of grade inflation across subjects [in recent years]". Katharine Birbalsingh wrote in 2011 of the problems she perceives in many community schools. She cites the impossibility of effective classroom management, bad teachers who cannot be dismissed, and government policies encouraging "soft" subjects. Birbalsingh has visited schools in Jamaica and India where pupils are desperate to gain the kind of education to which pupils in her own school (and their parents) were indifferent. She was a deputy head teacher in south London until she spoke at a Conservative Party conference in 2010 and was quickly sacked. Frank Chalk, who taught at an inner-city school for ten years before resigning in frustration, made similar claims in 2006. A 2010 analysis by The Guardian claimed that state faith schools were not taking a proportional share of the poorest pupils in their local areas, using free school meal claims as a proxy for socioeconomic status. The authors suggested that selection by religion led to over-representation of children from more well-off families. A National Union of Teachers survey in 2017 raised concerns that young teachers may be leaving the profession due to long working hours, high stress levels, and concerns about the effect on their mental wellbeing. A 2018 poll by the National Education Union suggested that four out of five teachers had considered leaving during the previous year. The Institute for Fiscal Studies claimed in 2017 that government plans for school spending would cause a "real-terms cut of 2.8% in per-pupil funding between 2016 and 2022". Just under a quarter of teachers who qualified since 2011 had left the profession by 2016. National Audit Office figures published in 2017 showed that more teachers left before retirement in 2016 than on 2011 and that, although overall teacher numbers in English state schools had increased by 15,500 over that period, the number of teachers in secondary schools had dropped by 10,800. The co-founder of the "Fair Funding for All Schools" campaign said at a rally in 2017 that shes was aware of schools that were asking parents for money because funding was falling short of what they need. The National Association of Head Teachers said in 2017 that it would be writing to all MPs to draw attention to problems faced by English state schools due to funding shortages and to warn that standards were at risk, after a claimed £2.8 billion reduction in frontline budgets since 2015. In 2018, the Education Policy Institute (EPI) said that England's schools faced a shortage of teachers that would lead to larger class sizes and more subjects being taught by staff without relevant degrees. The EPI called for "targeted salary supplements" for teachers in shortage subjects. This was opposed by head teachers' union ASCL as it would lead to different pay levels for staff with similar workloads. Funding for English schools will change to a national formula in 2018, with some schools likely to gain from the new formula and others likely to lose. Secretary of State for Education, Justine Greening has said the change means funding will depend less on the postcode lottery. The National Audit Office (NAO) has stated that total funding will be reduced by 8%. According to councils, funding cuts might prevent many local authorities meeting legal obligations to schools in their areas such as checking staff for criminal records and ensuring buildings are asbestos free. The Institute for Fiscal Studies maintains real spending on schooling per pupil has dropped by 8% since 2010. The UK Statistics Authority maintains the UK government uses misleading statistics and overestimates spending on education. The Public Accounts Committee, a cross-party parliamentary committee, has criticised the government's free school programme as poor value for money for spending excessively on unsuitable sites and building schools where none are needed. It has also said that other schools are not getting repairs done and need £7bn to be brought back to a satisfactory condition: "While the department is spending significant funds in creating 500 more free schools, even in areas with no shortage of places, existing schools struggle to live within their budgets and carry out routine maintenance". The government is planning to provide extra funding to expand grammar schools, raising concerns from the general secretary of the Association of School and College Leaders, Geoff Barton, who said: "We are disappointed that the government has decided to spend scarce funding on expanding grammar schools. While there are many good selective schools, just as there are many good non-selective schools, the evidence is clear that expanding the number of selective places is likely to be damaging to social mobility." ^ "Jo Johnson reappointed as universities and science minister". Times Higher Education. 16 July 2016. ^ Annex A: Total Departmental Spending, 7391 Departmental report 2008[permanent dead link], Department for Children, Schools and Families. £43 billion total spending on schools. ^ Table 1 Total Departmental spending, Departmental report 2008 Archived 31 January 2009 at the Wayback Machine, Department for Innovation, Universities and Skills. £14.3 billion spending on HE, £4.9 billion on FE. ^ a b "National pupil projections: July 2016". Department for Education. July 2016. Retrieved 16 July 2016. ^ "Higher Education Student Enrolments and Qualifications Obtained at Higher Education Providers in the United Kingdom 2014/15". Higher Education Statistics Agency. Archived from the original on 16 August 2016. Retrieved 16 July 2016. ^ a b c "Further education and skills: statistical first release (SFR)". Department for Business, Innovation and Skills. 23 June 2016. ^ "Level 2 and 3 attainment by young people aged 19 in 2015". Department for Education. 7 April 2016. Retrieved 16 July 2016. ^ "The national curriculum". Gov.uk. Retrieved 16 July 2016. ^ "Options at 16 and beyond". Kent County Council. Retrieved 16 July 2016. ^ a b c "School leaving age". Gov.uk. Retrieved 16 July 2016. ^ a b "Find and Compare Qualifications Frameworks". European Commission. Retrieved 16 July 2016. ^ a b "Compare different qualifications". Gov.uk. Retrieved 16 July 2016. ^ a b "The Bologna Process in higher education" (PDF). Quality Assurance Agency. 2010. Archived from the original (PDF) on 9 April 2016. Retrieved 16 July 2016. ^ Alison McCarty (6 June 2018). "Worldwide Perspective on Education and Women from University of London Alumni". University of London. Retrieved 8 August 2018. ^ "Our history". University of Bristol. Retrieved 8 August 2018. ^ "Women, Economics and UCL in the late 19th Century". Department of Economics. University College London. Retrieved 8 August 2018. ^ "Schools in the Great Britain". Rogalinski.com. Archived from the original on 18 May 2012. Retrieved 7 January 2012. ^ a b Education and Skills Act 2008, Office of Public Sector Information. ^ Section 8. Compulsory school age, Education Act 1996 Archived 27 May 2010 at the Wayback Machine, 1996 c.56, UK Parliament. ^ "School attendance and absence: the law". Directgov. ^ "The Education (Start of Compulsory School Age) Order 1998". The National Archives. ^ The Education (Information as to Provision of Education) (England) Regulations 1994, Statutory Instrument 1994 No. 1256, UK Parliament. ^ Jeevan Vasagar (31 January 2012). "State boarding school boom: surge in pupils living away from home". Guardian. ^ "Categories of Schools – Overview". GovernorNet. Department for Children, Schools and Families. 5 September 2003. Archived from the original on 13 January 2009. Retrieved 10 December 2008. ^ "The Composition of Schools in England" (PDF). Department for Children, Schools and Families. June 2008. Archived from the original (PDF) on 24 February 2009. ^ Types of School Archived 4 May 2009 at the Wayback Machine, Citizens Advice Bureau. ^ "What are Academies?". Standards Site. Department for Children, Schools and Families. Archived from the original on 7 December 2008. Retrieved 10 December 2008. ^ "Voluntary Aided Schools". Teachernet. Department for Children, Schools and Families. 8 January 2008. Archived from the original on 10 February 2009. ^ Clyde Chitty (16 November 2002). "The Right to a Comprehensive Education". Second Caroline Benn Memorial Lecture. Retrieved 22 January 2009. ^ Table 1.2: Full-time and Part-time pupils by age, gender and school type, Education and Training Statistics for the United Kingdom: 2008 Archived 22 December 2008 at the Wayback Machine, Department for Children, Schools and Families. Enrolment at independent schools is not partitioned by stages in the source, and has been estimated using an equal division. The error is within the precision of these figures. ^ "Educating your child at home". Directgov. Retrieved 9 December 2008. ^ Richard Garner (28 January 2002). "Rising number of parents decide they can do a better job than the education system". The Independent. London. Retrieved 9 December 2008. ^ Mathew Charles (18 March 2005). "Growth market in home education". BBC News. Retrieved 9 December 2008. ^ Katie Razzall; Lewis Hannam (26 September 2007). "UK home-school cases soar". Channel 4 News. Retrieved 9 December 2008. ^ "Elective Home Education: Guidelines for Local Authorities" (PDF). Department for Children, Schools and Families. 2007. Retrieved 10 December 2008. ^ "Traineeships". Skills Funding Agency. 21 February 2014. Retrieved 17 July 2016. ^ "A Guide to Apprenticeships". National Apprenticeship Service. 29 June 2015. Retrieved 17 July 2016. ^ Clark, Laura (25 November 2014). "Apprentices beat graduates in jobs race: University leavers three times more likely to be unemployed a year after finishing course". Daily Mail. Retrieved 4 December 2014. ^ Dr Philip Kirby (9 October 2015). "Levels of Success: The potential of UK apprenticeships". Sutton Trust. Retrieved 17 July 2016. ^ "The Frameworks for Higher Education Qualifications of UK Degree-Awarding Bodies" (PDF). November 2014. p. 17. Archived from the original (PDF) on 5 March 2016. Retrieved 4 November 2016. ^ Heidi Blake (10 November 2010). "Grants, loans and tuition fees: a timeline of how university funding has evolved". Daily Telegraph. ^ "About us". Quality Assurance Agency. Retrieved 16 July 2016. ^ "Teacher training providers". Office for Standards in Education. 5 December 2008. Archived from the original on 19 December 2008. ^ Select Committee on Science and Technology (17 July 2012). "Higher Education in Science, Technology, Engineering and Mathematics (STEM) subjects" (PDF). House of Lords. p. 26. First degrees have, in the past, usually lasted three years and resulted in a Bachelors degree. There has, however, been a move towards four year courses in STEM subjects, particularly engineering, leading to an integrated Masters degree and increasingly Masters are seen as a prerequisite for postgraduate study internationally. Such a degree, or its equivalent at Masters level, is essential to achieving Chartered status in engineering and some other areas. ^ Sara McDonnell (March 2011). "What is a PhD?". jobs.ac.uk. Retrieved 17 July 2016. ^ "UKCISA - Fees, funding and Student Support". Retrieved 25 February 2010. UK Council for International Student Affairs > How much will the 'overseas' fee for my course be? ^ "Qualifications can cross boundaries" (PDF). Quality Assurance Agency, Scottish Credit and Qualifications Framework Partnership, CCEA Accreditation, Ofqual, CQFW Welsh Government and Quality and Qualifications Ireland. September 2014. Archived from the original (PDF) on 28 May 2016. Retrieved 19 July 2016. ^ a b "How many poor children go to faith schools?". The Guardian. 5 March 2012. Retrieved 7 March 2012. ^ Jessica Shepherd and Simon Rogers (5 March 2012). "Church schools shun poorest pupils". The Guardian. Retrieved 7 March 2012. ^ Richard Adams (14 April 2017). "Demanding workload driving young teachers out of profession". The Guardian. ^ Hannah Richardson (15 April 2017). "Workload 'pushing young teachers to the brink'". BBC News. ^ Richard Adams (1 April 2018). "Vast majority of teachers considered quitting in past year – poll". The Guardian. ^ Sean Coughlan (21 June 2017). "Heads warn parents of 'cash-starved schools'". BBC News. ^ Michael Savage (8 July 2017). "Almost a quarter of teachers who have qualified since 2011 have left profession". The Guardian. ^ Hannah Richardson (12 September 2017). "Teacher retention efforts 'not working'". BBC News. ^ Press Association (16 July 2017). "Schools asking parents for 'money via direct debit' owing to cuts". The Guardian. ^ Richard Adams (16 October 2017). "English school budgets facing 'breaking point', warn headteachers". The Guardian. ^ Richard Adams (13 July 2017). "Give teachers in poorer schools subsidised housing – MPs". The Guardian. ^ a b Devlin, Hannah (23 March 2018). "Selective schools make no difference to GCSE results, study says". the Guardian. Retrieved 29 March 2018. ^ Sean Coughlan (30 August 2018). "England's schools face 'severe' teacher shortage". BBC News. ^ Press Association (30 August 2018). "Salary supplements 'could halt teacher shortages in England'". The Guardian. Peal, Robert (2014). Progressively worse: The Burden of Bad Ideas in British Schools. Civitas. p. 298. ISBN 978-1906837624. Archived from the original on 25 June 2014. Retrieved 19 June 2014.